E C R Lorac set most of her wartime mysteries in London. Then her characters returned from war and did one of two things: some stayed in the city and tried to renovate the bomb damage, but others set out for the country. 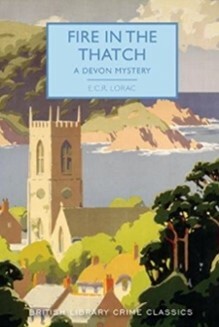 Fire in the Thatch, first published in 1946, shares the background of several of those early post-war books, being set in the West Country. As Lorac wrote a series, taking her detective to Lunedale in northern Lancashire, so at one time I would have said she was a forerunner of James Herriot and his northern hills. Today a book such as Fire in the Thatch has a much different significance. Now, despite my first paragraph and despite its West Country setting, Fire in the Thatch is set during the Second World War. The cover blurb says “The Second World War is drawing to a close”, but it is not. One of the absent characters is a Prisoner of War of the Japanese, yet his family do not seem too worried, as they would have been after his absence of many years. This makes the book more likely set in the spring and summer of 1943 – long enough for Denis St Cyre’s absence to have struck home, and his petulant and spoilt wife to have been driven out of London to live with her father-in-law on his small estate. Meanwhile Nicholas Vaughan has been invalided out of the Navy (not the army as the cover blurb says), recovering from near-blindness, and has decided to take a small holding on the St Cyre estate. The book is about a quarter of the way through before an old naval friend of Vaughan interviews Lorac’s Chief Inspector Macdonald, trying to persuade him to investigate the death of his friend. It seems that Vaughan’s thatched cottage has burned down and a body was found in the remains. Various dubious characters – mainly wealthy London financiers – are in the area, along with lawyers and estate agents who drop in. They share June St Cyre’s taste for cocktails and dancing. In turn June is very different from her tweed-wearing sister-in-law, Anne, the only woman to have seen inside Vaughan’s renovated cottage. Then, when Macdonald comes to interview these potential witnesses, at least one puts questions to him: is he sure that Vaughan was who he said he was, was the brim of Vaughan’s hat more than just an eyeshade, are the remains from the ashes those of Vaughan or of someone else? Have the police been caught wanting? A knowledge of English geography and an awareness of abnormal psychology – with some references to Macdonald’s childhood visits to the Scottish highlands – helps solve the mystery. Unlike Ernest Hemingway’s Men Without Women, what is notable about Fire in the Thatch is that nearly every character, male and female, is without a partner. That is mostly because they are somewhere else, doing something war-related: prisoner of war, driving an ambulance in town, or simply separated. Vaughan, although he never said this explicitly, might have been waiting for someone, too. It is in those motives for separation and the crazed desire to make re-connection that the solution lies. The same motives and the same devastating crimes occur still: possession, keeping face, and even sadistic power. There is melodrama in Lorac’s final showdown, but it is melodrama in presentation not in reason.